Bradycardia pacemakers are devices implanted underneath the skin, usually in the upper chest. They send impulses to the heart using small leads, inserted through veins into the heart chambers. These electrical impulses stimulate the heart to contract. Pacemakers can also detect your own heart rhythm, so they know when your heart rate drops below an acceptable level. This feature allows them to sit quietly in the background, only activating when the heart rate is too slow. Modern pacemakers have many advanced features, including an ability to respond to exercise and increase the heart rate. The pacemaker can be programmed using a remote device, that is placed outside the body on top of the skin. Once implanted the pacemaker can often be left for years, and adjusted using remote software without the need to remove it. Who would benefit from insertion of a bradycardia pacemaker? As people age, the conduction tissue in the heart can deteriorate. Many people are unaffected during their lifetime, but in some individuals, abnormalities in conduction can lead to very slow heart rates. Failure of communication between the upper chambers of the heart (atria) and the lower chambers (ventricles) can cause heart block. This may present with a variety of different symptoms, related to impairment of heart function. Low heart rates and dis-coordinated contraction can lead to exertional shortness of breath, low blood pressure, falls, dizziness or episodes of collapse. Recurrent falls not only present a risk of injury, but also affect peoples confidence, leading to decreased mobility through fear of falling. Pacemaker implantation is a relatively short procedure, lasting between 40 and 90 minutes. It is normally performed under local anaesthetic, often with a sedative medication. Anaesthetic is introduced under the skin of the upper chest, a little below the collar bone, which makes the area go numb. A small incision approximately 2 inches in diameter is made and the pacemaker is placed underneath the skin. Veins that normally carry blood from the arm, back towards the heart, run under the shoulder and the collar bone. It is often relatively easy to access these veins and pass one or two leads down the vessels to the heart chambers. The veins already run to to the heart, so it is just a matter of guiding them under X ray to the correct positions. 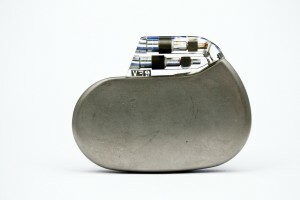 Once the leads are positioned, they are connected to the pacemaker and incision closed. The procedure is performed in a pacing room, which is a sterile theatre environment with additional facilities to perform x rays during the procedure. The cardiologist performing the procedure will be dressed in surgical gowns and wear a mask to reduce the chances of infection. It is normal for antibiotics to be administered around the time of the procedure, although the type of antibiotic will differ between centres. It is worth considering the two main components of the pacemaker which include the generator (the pacemaker box that contains the electronics and the battery), and the leads. The most common reason for a pacemaker to be changed is because the battery runs low, although modern pacemaker batteries last for years. This can be predicted months, if not years in advance, by software in the pacemaker that downloads information each time the pacemaker is checked in the pacing clinic. Battery life can vary significantly depending upon how often the pacemaker is active. Some people with very poor conduction tissue in their heart will use their pacemaker all of the time, while in others the pacemaker may only be ‘sensing’ the natural heart rhythm and rarely have to stimulate the heart. Failure of the actual device itself is very uncommon and devices have been tried and tested in many thousands of people over long periods of time. Occasionally the pacemaker leads need replacing. Once more, information about the leads can be obtained through the software in the device at pacing clinic. How long does it take to recover following a pacemaker? As the surgery is relatively localised, the recovery times following a pacemaker are normally very quick. Most people will be able to sit up and walk around after a few hours. Care needs to be taken not to use the arm excessively on the side of the pacemaker in the early stages. Strenuous activity should be avoided for 4-6 weeks. This is to prevent traction on the skin and leads, while everything heals. It is normal to experience some bruising around the site, although this usually settles within a week or so. Patients in some centres go home the same day, but others stay overnight for observation and go home the next day. What about driving after a pacemaker? You should check current guidelines with the DVLA and inform them that you have had a pacemaker implanted. Normally patients with a standard driving licence are allowed to drive after a week, following implantation. This is providing other factors do not restrict driving over a longer period such as a recent heart attack. National Heart, Lung and Blood Institute: What is a pacemaker?